BOISTEROUS is a Grade One winning son of sire of sires Distorted Humor; sire of 2 champions and 48 graded stakes winners. BOISTEROUS is out of stakes winner and graded stakes-placed Emanating, by Cox’s Ridge, she is a half sister to NYRA Mile Handicap (gr. I) winner Gold Fever. BOISTEROUS is a multiple graded stakes winner with earnings of $1,458,792. 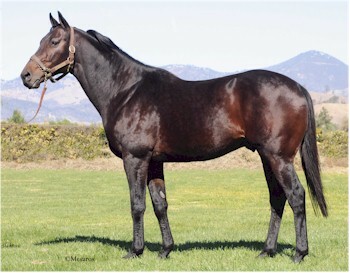 BOISTEROUS Sire of Stakes Winner KOOKIE GAL, $107,820, Soviet Problem S.
BOISTEROUS California’s Leading Freshman Sire of 2018! KOOKIE GAL, 2 wins at 2,$107,820, Soviet Problem S.
Miss Boisterous, 2 wins at 3, 2019, $17,290. Spider Jorgensen, winner at 3, 2019, $9,180. $3,529,412), Regal Ransom (Champion, $1,894,835), Don Dandy (Champion, $413,963), Hillaby (Champion, $282,265), Pathfork (Champion, $237,506), =Some Are Bent (AUS) (Champion), Drosselmeyer ($3,728,170, Breeders’ Cup Classic [G1], etc. ), Flower Alley ($2,533,910, Travers S. [G1], etc. ), Hystericalady ($2,390,556, Humana Distaff S. [G1], etc.). 607 starters, 49 black type winners, 447 winners, $41,382,518. Sire of 328 daughters, 1953 foals, 95 black type winners, including Orientate (Champion, $1,716,950), Nuclear Debate (Champion 5 times, $1,119,689), =Halland Park Girl (IRE) (Champion, $197,443), Sierra Nights (Champion, $19,080), Personal Decision (Champion twice), Boisterous ($1,458,792, Man o’ War S. [G1], etc. ), Pool Play ($1,313,371, Stephen Foster H. [G1], etc. ), West by West ($1,038,123, Nassau County Handicap [G1], etc.). EMANATING, by Cox’s Ridge. 4 wins, 2 to 4, $273,030 in NA. Won Polly Drummond S. [L] (DEL, $45,000). 2nd All Along S. [G3]. 3rd Test S. [G1], Lake Placid Handicap [G2]. BOISTEROUS (c, by Distorted Humor). Black type winner, see records. Radiating (f, by Seeking the Gold). (SAR, $10,940). 3rd Hutcheson S. [G2]. Sire. EMANATING (f, by Cox’s Ridge). Black type winner, see above. Clearance Sail. 5 wins, 2 to 6, $101,303 in NA. Judith Lynne. 3 wins at 3, $79,301 in NA. Producer. ALLEGRE (c, by Orientate). 5 wins at 3 and 4, $87,960 in US. Won Wildcat H. (TUP, $30,000), Black Bart S. [N]. 3rd Walter R. Cluer Memorial S. (TUP, $5,000). Preservation Hall (f, by Dixieland Band). Placed at 3, $3,840 in NA. Producer. Arabian Dancer, by Damascus. 2 wins at 2, $51,377 in NA. 2nd Matron S.-G1. [G1], Westchester Handicap [G3]. 3rd Woodward S. [G1], Discovery Handicap [G3], Ben Ali S. [G3], Baltimore Breeders Cup H. [G3]. Sire. LEAD KINDLY LIGHT (f, by Majestic Light). Black type winner, see above. JACKPOT (c, by Seeking the Gold). 4 wins, 4 to 6, $288,915 in NA. Won Gulfstream Park Handicap [G2]. Leap for Joy (c, by Nijinsky II). Winner at 3, $34,580 in NA. At 4 Sent to Argentina. Sire. Our Lucky Son (g, by Elusive Quality). 3 wins at 5 and 6, 2015, $88,280 in US. 2nd H. B. P. A. Sprint S. [N] (CBY, $8,000). Your Pace Or Mine. 2 wins at 3, 2015, $56,117 in US. Cymbal (f, by Danzig). Unraced. Producer. GALLANT TALENT (c, by Local Talent). 4 wins, 2 to 5, $49,642 in NA. Won Houston Juvenile S. (HOU, $17,940). Quiet Andrew. Winner at 2, $72,940 in NA. SAARLAND (c, by Unbridled). 5 wins, 2 to 4, $595,250 in NA. Won Remsen S. [G2]. 2nd Metropolitan Handicap [G1], Gotham S. [G3], Westchester Handicap [G3], Westchester Handicap [G3]. 3rd Brooklyn Handicap [G2]. For Sport. 3 wins at 3 and 4, $71,416 in NA. At 5 Sent to Japan. Handicap [L] (LAD, $10,000). At 7 Sent to Venezuela. Sire. Arabian Dancer (f, by Damascus). Black type placed winner, see above. Wikki Up (c, by Tom Rolfe). 3 wins at 3, $94,069 in NA. 2nd Display Handicap [L] (AQU, $18,678). 3rd Annapolis Handicap [L] (LRL, $6,031). Lead the Dance (c, by Nijinsky II). Winner at 3, $11,400 in NA. Race Record: (In USA) at 3, two wins; at 4, four wins (Red Smith H. [G2], Knickerbocker S. [G3], Three Coins Up S. (BEL, $36,000)), once 3rd (Man O’ War S. [G1]); at 5, three wins (Red Smith H. [G2], Fort Marcy S. [G3], Knickerbocker S. [G3]), twice 2nd (Arlington H. [G3], River City H. [G3]), once 3rd (Woodford Reserve Manhattan H. [G1]); at 6, two wins (Man o’ War S. [G1], Monmouth S. [G2]), once 2nd (Ben Ali S. [G3]), once 3rd (Bowling Green H. [G2]); at 7, 2014, one win, once 3rd (Woodford Reserve Turf Classic S. [G1]). Total: 12 wins, 3 times 2nd, 4 times 3rd. Earned $1,458,792.